Some people think leaders are born, while others believe that leaders are made. But all leaders need to be built up. Within the pages of The Power of Leadership ($12.49, paperback, 9781545633311; $5.99, e-book, 9781545633328), readers will discover Christian leadership principles to help build up leaders. Christian leadership principles are lacking in both the sacred and secular realms of society. Marcus Davidson serves as senior pastor of New Mount Olive Baptist Church in Fort Lauderdale, Florida. He holds degrees from Alabama Agricultural and Mechanical University, Samford University and the Southern Baptist Theological Seminary. His website is http://www.pastormarcusdavidson.com. Xulon Press, a division of Salem Media Group, is the world’s largest Christian self-publisher, with more than 12,000 titles published to date. 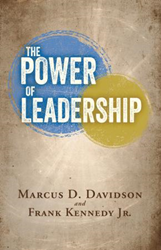 Retailers may order The Power of Leadership through Ingram Book Company and/or Spring Arbor Book Distributors. The book is available online through xulonpress.com/bookstore, amazon.com, and barnesandnoble.com.